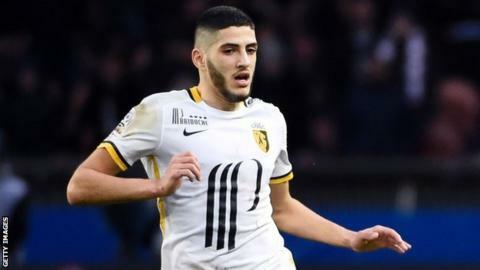 Former France youth international striker Yassine Benzia has pledged his senior future to Algeria. The 21-year-old told BBC Sport last year that he was considering an approach from Algeria. The Lille striker was born in France and played for them at every youth level from under-16 but is eligible for Algeria through his parents. The Algeria Football Federation said it "will immediately begin the process of registering the player with Fifa." The federation added Benzia met its president Mohamed Raouraoua this week to finalise his choice to play for the Desert Foxes. Even though Fifa is yet to receive Benzia's request for a switch of nationality, the Algerian football authority is confident of a swift approval by the game's governing body. Benzia has scored 26 goals in 43 appearances during his time playing for France's youth teams. His capture will come as a morale boost for Algeria after they were snubbed by Lyon striker Nabil Fekir last year. Benzia started his career at Lyon where he progressed from the academy to the senior squad and made his senior debut against Nice in May 2012. He switched to Ligue 1 rivals Lille in August 2015 in search of regular football and has already scored five goals in 20 appearances for the club this season.